Here’s an extra easy project for Halloween! Stash the candy for your Halloween visitors in a clay pot or terra cotta witch’s cauldron. This magically magnificent trick relies on finding an appropriately shaped pot and some homemade graffiti. Keep an eye open for a clay pot similar to the one shown in photo; they are available at most garden and home improvement centres. Prepare your clay pot by cleaning and drying the pot thoroughly. Paint the pot black inside and out. Allow the paint to dry completely. 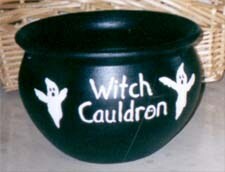 With white paint, write the words “witch cauldron” on the front of the pot and draw a couple of ghosts. Refer to the photo for pattern. Add 2 dots in the centre of the letter “0” for a little extra fun. To really spook your Halloween visitors, add some dry ice and you’ll have a realistic little puff of smoke that will seem to come from whatever potion your witch is brewing. Tips: Do not paint the inside of the container, or use a container of dry ice placed inside the pot (craft paint and dry ice don’t mix well). Also add a screen on top of the pot if you do use dry ice, just for a little extra protection from small children that may be a little too curious.